Legionaire of the Year Harley Johnson (right) is pictured with Commander John Hood. JoAnne Newsome presents Commander John Hood a check for $200 for the kitchen fund. Commander John Hood and JoAnne Newsome are pictured with Poppy certificates. 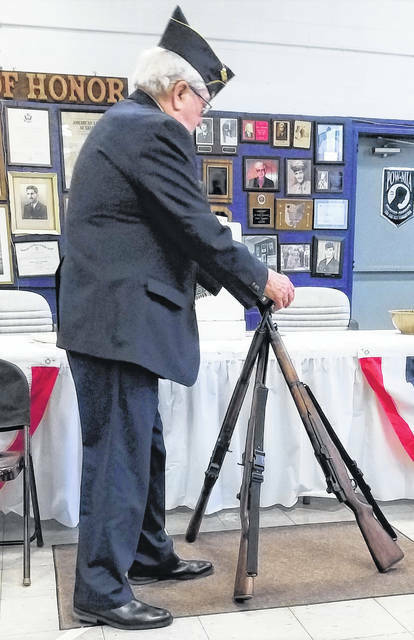 Wally Hatfield places a cap on rifles as part of the ceremony. 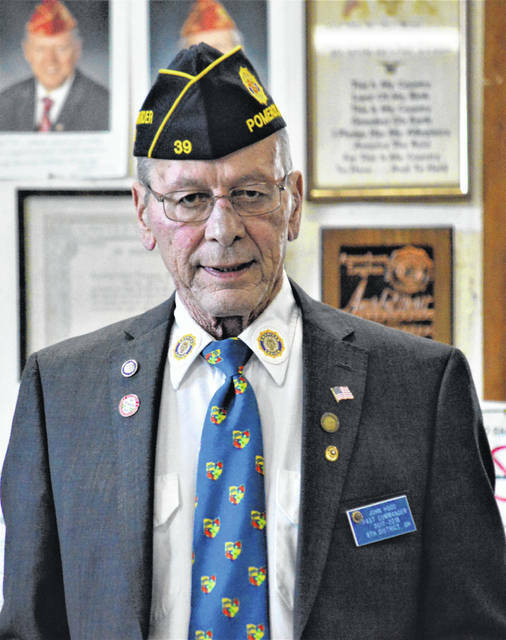 ROCKSPRINGS — The annual birthday dinner of the American Legion Post 39 was held recently with grace for the meal given by the post chaplain, Jerry Frederick. The meeting opened with the presentation of the colors, prayer by Jerry Frederick and all present repeating the Pledge of Allegiance. 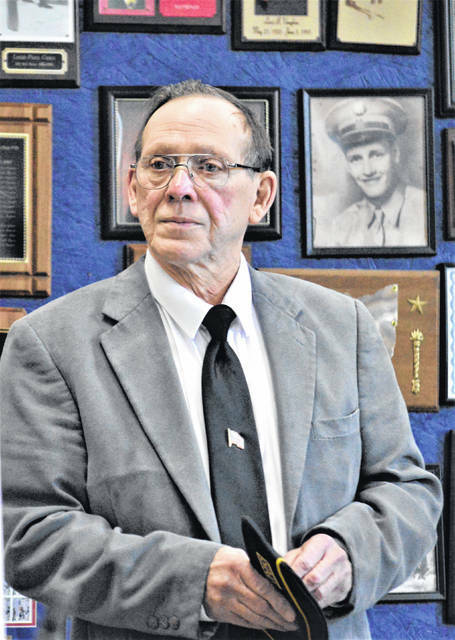 It was a quiet and somber moment when Commander John Hood led the “Post Everlasting Ceremony” for the four veterans and members of Post 39 that have passed away in the past year. They were Ted Warner, Jack Lewis, Bill Little and Bill Edwards. Wally Hatfield placed a cap on the three standing rifles and after a prayer by chaplain Jerry Frederick. Hatfield placed their names in the helmet. Sitting beside the rifles and the helmet was an empty chair as a remembrance of all those men that are Missing in Action or Prisoners of War. Taps were played after which the cap was removed from the rifles. In attendance was David Holter, a veteran of World War II. Commander John Hood spoke about the Legion being 100 years old, having been instituted in 1919. He read all the names that are on the charter and explained how all the things the legion stood for then were still being practiced today. He also said that the legion played a big part in the rehabilitation of men returning from the military and war to adjust to civilian life again. One of the things the legion does is sponsor boys going to Boys State and he told how one boy from Meigs County went all the way to the state level and how proud he was to see him perform. He also mentioned that Post 39 has about 20 to 25 men at each meeting where other post is not so lucky. The 50-50 drawing was won by Roger and Marlene Swartz and they announced that half of it would go to the kitchen fund and the other half to the ladies auxiliary. Gas cards were won by JoAnn Williams and Norman Price. Harley Johnson was announced as winner of the “Legionnaire of the Year” and wasgiven a trophy by John Hood, Commander. JoAnne Newsome, president of the Ladies Auxiliary introduced Carol Erwin and Pat Drake. Pat was from the Kibble Foundation, which had made a donation to the Ladies Auxiliary recently. Newsome recognized those that helped with Poppy Days last year and passed out certificates to them. Chaplain Jerry Frederick closed the legion’s 100th Birthday meeting with prayer. 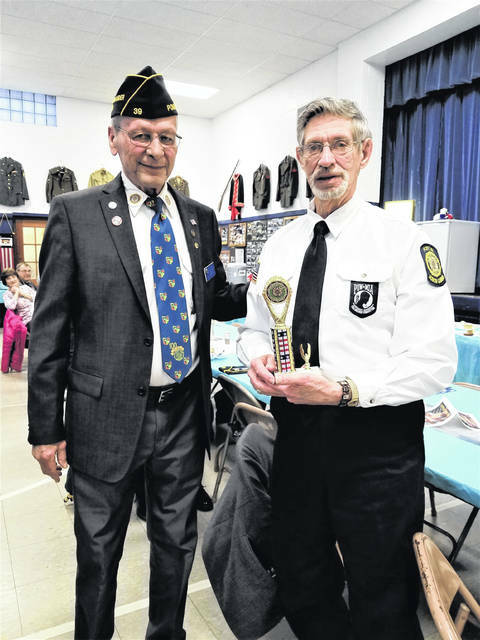 Photos and information provided by Kathryn Johnson, Historian of the Ladies Auxiliary of American Legion Post 39.
https://www.mydailysentinel.com/wp-content/uploads/sites/14/2019/03/web1_3.29-Legion-2_ne201932716820534.jpgLegionaire of the Year Harley Johnson (right) is pictured with Commander John Hood. 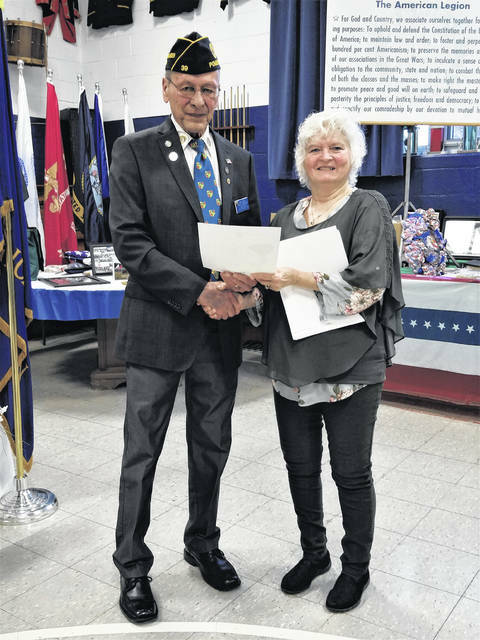 https://www.mydailysentinel.com/wp-content/uploads/sites/14/2019/03/web1_3.29-Legion-3_ne201932716824316.jpgJoAnne Newsome presents Commander John Hood a check for $200 for the kitchen fund. 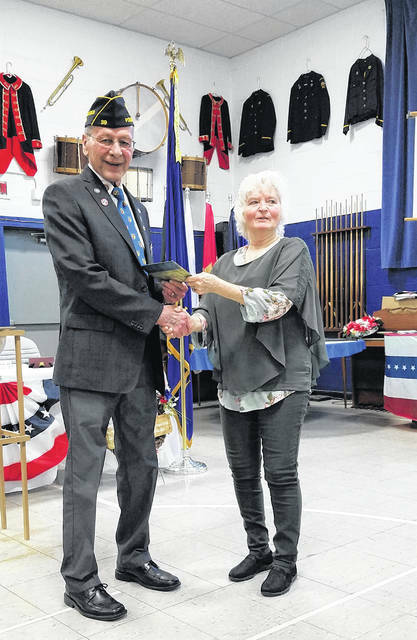 https://www.mydailysentinel.com/wp-content/uploads/sites/14/2019/03/web1_3.29-Legion-4_ne201932716828899.jpgCommander John Hood and JoAnne Newsome are pictured with Poppy certificates. 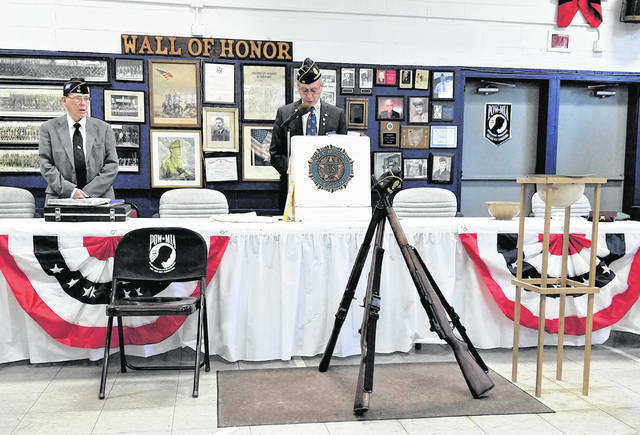 https://www.mydailysentinel.com/wp-content/uploads/sites/14/2019/03/web1_3.29-Legion-5_ne201932716832333.jpgWally Hatfield places a cap on rifles as part of the ceremony.